Last weekend I gave the survivor talk for our ACS Race for the Cure-and I told them about the wonderful effect humor in the form of Patrick McManus had on my recovery!! Seven years ago I was diagnosed with bilateral breast cancer stage IIIB, and was terrified out of my mind. This is a section of my talk. When the diagnosed of cancer was official, I was terrified. Neither could I read any of the words in the stacks of literature they handed me. What I could finally deduce was that the cancerous mass was too big to remove surgically, so they would begin high dose/rapid infusion chemo, and three weeks after treatment began, my hair would be gone. One day my husband, Roger, and I were invited to dinner with extended family. During dinner different family members asked me the gentlest possible questions about my cancer and treatment. I could not answer even one of their questions. I realized I needed to make significant changes in my thinking. One of the first thoughts that came to mind was: “A merry heart does good, like medicine” from Proverbs 17. My heart had not been “merry” for a long time. Immediately I told Roger about a book I remembered by Dr. Bernie Siegel who conducted research on the effect of laughter for terminally ill Cancer patients. We made a decision right then to devote time every evening to laughter and we knew just where to turn. One of our favorite authors when our kids were little had been Patrick McManus, a humor writer for [Outdoor Life and Field & Stream] whose books were a collections of his stories. His best stories were memories of his antics with his childhood friend Crazy Eddie Muldoon and an old woodsman named Rancid Crabtree! When we read his stories we used to laugh until we cried! Then our kids grew up and moved away taking our McManus book collection with them! So that evening Rog drove to Barnes and Nobel and bought ten new McManus books for our library. 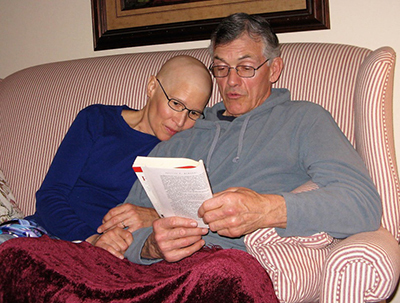 Lou and her husband, Roger, reading Patrick McManus stories together. At home that night we read one of our favorite stories, “The Night the Bear Ate Goombaw.” We laughed until tears ran down our faces and joy began to replace fear in our house! The next day, in response to five requests from friends, we opened a CaringBridge account (which is a free non-profit website that helps connect patients with family and friends). In CaringBridge we wrote our story. Our family & friends responded. 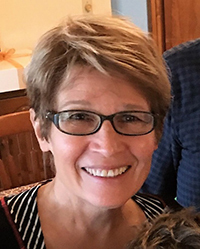 As the first words of encouragement, prayers, and Bible promises arrived in my computer, I found my mind lifted above my fear, and for the first time after diagnosis I felt peace. The light and joy from good books had started us on this journey toward peace, and I found that the words of friends and family gave me a confidence that I was not alone and that God was with me. Thank you Patrick McManus and publishers! Editor’s note: this post has been edited from a longer post, focusing primarily on Pat’s stories. For the original post, click here.